I have used about 1/4 of the GLS, citrus lavender flavor. Would like to swap for some un used mac makeup - email me for specifics. What scent is your Gentle Lather Shampoo? You're looking for the Too Shea, right? I have citrus lavendar and yes - too shea is what I'm looking for. Are you still wanting to try the TS? Or have you changed your mind and want MAC? :? Sorry, I forgot about this. I have a bottle of unscented TS. LOL -- I should have deleted this whole thing and started over cuz now it's getting confusing but I was too lazy. anyway.... yeah, I changed my mind on the too shea. 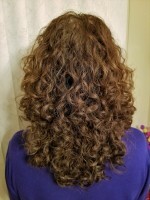 I have a trial size and used some the other night and my hair came out really strange and waxy feeling. I shampooed everything out and used my regular condish and all is fine now. I don't think I like the too shea anymore. So, yeah, I'm looking for some MAC makeup. Maybe some lipstick or eyeshadow. OK. I didn't like the TS sample I used either; it didn't feel right, didn't do anything for my hair. It actually felt like nothing was in my hair, despite all the comments that it's rich. :? I guess I need to make a new swap/sell list and post it too.